Priyanka Chopra donned a custom Ralph Lauren number for her wedding and her ensemble was accompanied by a 75 ft veil! 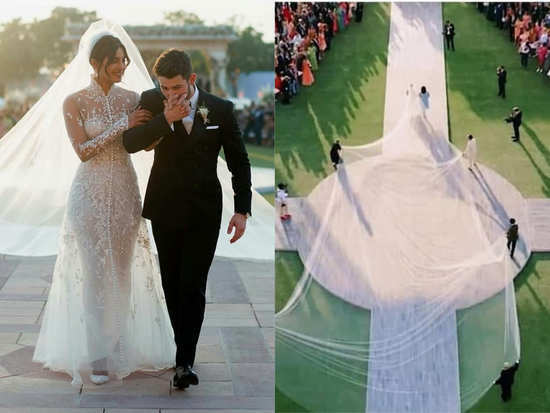 If there is one thing taking over the Internet right now, it's Priyanka Chopra and Nick Jonas' nuptials. The newly-weds recently tied the knot in Jodhpur and pictures from both, their Hindu and Christian weddings have been released. However, the Internet is interested particularly in her Christian wedding look. Styled by Mimi Cuttrell, the actress chose a custom Ralph Lauren number that was accompanied with a - wait for it - 75 ft veil! Now, much as you have guessed, her veil has become the centre of hilarious memes that have taken over the Internet. Meanwhile, Priyanka and Nick recently hosted a Delhi wedding reception that was graced by PM, Narendra Modi and for the night, Priyanka looked dreamy in a Falguni Shane Peacock number, while Nick looked strapping in a blue velvet suit. The couple will soon be hosting a Mumbai reception for Priyanka’s friends from the film fraternity, however, the date has not been confirmed yet. 3‘Zero's’ Issaqbaazi: Shah Rukh Khan and Salman Khan will make you want to groove along! 4Priyanka Chopra and Nick Jonas are stars of Vogue’s first-ever digital cover! 5‘Simmba trailer’: The Ranveer Singh starrer has blockbuster written all over it! 6Priyanka Chopra and Nick Jonas' mehendi ceremony was better than we ever imagined it would be! 7Priyanka Chopra and Nick Jonas are now man and wife!